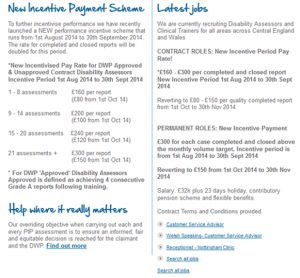 Capita and PIP: Fancy making £6,300 a month doing Disability assessments? A very interesting piece of information has come to light, which shows that Capita, which relies in part on contracted staff to deliver the PIP contract, has doubled the incentives offered to their staff, supposedly in order to clear the backlog which has accumulated since the introduction of PIP. As can be seen in the document below, a contracted HP can earn up to £6,300 a month for 21 assessments, after the report is completed. The target does not seem to be stretching it, as it represents 1 assessment per working day. Even if paying this whopping sum, Capita is still bound a make a profit. To further incentivise performance we have recently launched a NEW performance incentive scheme that runs from 1st August 2014 to 30th September 2014. The rate for completed and closed reports will be doubled for this period. Approved is defined as achieving 4 consecutive Grade A reports following training. CONTRACT ROLES: New Incentive Period Pay Rate! Salary: £32k plus 23 days holiday, contributory pension scheme and flexible benefits. People on PIP, don’t even receive that much in year, it’s just discrimination against disabled people of this country. They said Pip was supposed to save money, reading this article its going cost many more millions of pounds the Nasty party at its best, Looking after the rich and screwing the poor. Stop the Changes to Access to Work meeting, October 23rd, London Can you donate 50p to DPAC’s work?